Apple has refreshed the iPod touch along with introducing the iPhone 5, and the new device gets some of the same enhancements as its phone cousin, especially the 4-inch Retina Display. The iPod touch costs $299 and $399 for a 32GB and 64GB model, respectively. The new iPod touch includes a 5-megapixel camera capable of recording 1080p HD video, and underneath it gets Apple’s A5 microprocessor. Siri, Apple’s “intelligent assistant,” is now included on the iPod touch, which comes with iOS 6. Previous iPod touch models have closely resembled the iPhone, right down to their case colors. 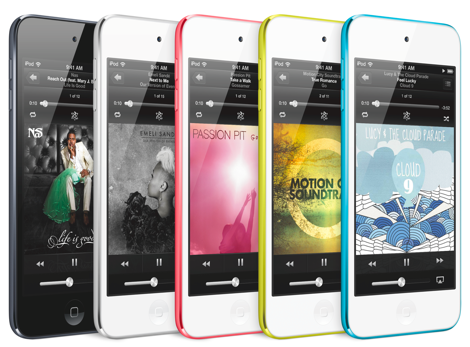 No longer now – the newest iPod touch comes in five hues, including pink, yellow, blue, white and silver, and black and slate. (The latter two choices complement the new iPhone 5). Like the iPhone 5, the iPod touch also sports the reversible “Lightning” connector which replaces the 30-pin dock connector found on older devices. Also refreshed today is the iPod nano, billed by Apple as “the thinnest iPod ever.” It measures 5mm thick, and sports a 2.5-inch multi-touch enabled display. A home button, volume buttons, and buttons to play, pause and change songs are incorporated into the interface. An FM radio, pedometer gauge and support for Nike+ complete the features, along with the Lightning interface. The iPod nano comes in seven colors – pink, yellow, blue, green, purple, silver and slate. It’ll debut in October for $149 for a 16GB model. Apple also noted the iPod shuffle, available today in the same spectrum of colors as the new nano – pink, yellow, blue, green, purple, silver and slate, all for $49 for a 2GB model. Apple made no mention in the press release announcing the new iPod models of its venerable iPod classic, the last click wheel-enabled iPod, but that device remains part of the product matrix on Apple’s Web site. The iPod classic sports the highest capacity of any iPod model – 160GB, thanks to its use of a hard drive instead of the flash memory found on other iPod devices – and it costs $249.